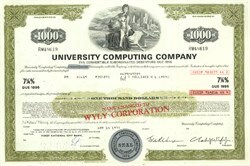 Pack of 100 Certificates - University Computing Company - Convertibile $1,000 Bond - Charles Wyly Jr as President 1970's - Price includes shipping costs to U.S.
Home > Certificate Quantities for Educators / Business Promotions > Pack of 100 Certificates - University Computing Company - Convertibile $1,000 Bond - Charles Wyly Jr as President 1970's - Price includes shipping costs to U.S.
Beautiful engraved cancelled Bond Certificate from the University Computing Company issued in no later than 1977. Early computer company certificates are becoming scarce and highly desirable. 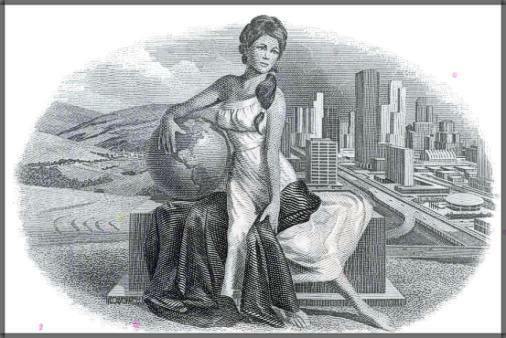 This cancelled certificate has an ornate green border with a vignette of an allegorical woman sitting in front of a downtown area holding a globe in her hand. Printed signature of the company's president, Charles Wyly Jr.
Charles Wyly Jr. (October 13, 1933 � August 7, 2011) was an American entrepreneur and businessman, philanthropist, civic leader, and a major contributor to Republican causes and Dallas art projects. This included $20 million to build a performing arts center in Dallas. In 2006, Forbes magazine estimated his net worth at $1 billion. His younger brother, Samuel Wyly, is nearly equal in wealth; the two brothers were close with their business affairs, and were often referred to as the "Wyly brothers". Together the brothers had donated almost $2.5 million to more than 200 Republican candidates and committees at the federal level over the past two decades. Wyly was inducted into the Louisiana Tech University Athletic Hall of Fame in 2003. Born during the Great Depression, Charles Wyly was a child when the collapsed economy forced the surrender of his family's cotton farm in Lake Providence, Louisiana. He and his younger brother went on to attend Louisiana Tech University in the 1950s, then went to work for IBM. Charles Wyly helped his brother, Samuel, run their startup computer software company, University Computing, and later founded and led several other companies. He also was a former member of the White House Advisory Council for Management Improvement. During their lifetime, the Wyly brothers together gave more than ninety million dollars to a wide range of charities. In the summer of 2010, the Internal Revenue Service and Securities and Exchange Commission accused Wyly and his brother of using offshore havens to hide more than a half a billion dollars in profits over 13 years of insider stock trading and fraud. The brothers denied the claims and were fighting the allegations. On Sunday, August 7, 2011, Wyly, who maintained a home in the rural town of Woody Creek in Roaring Fork Valley near Aspen, Colorado, was turning onto a highway near the local airport when his Porsche was hit by a sport utility vehicle according to the Colorado State Highway Patrol. Wyly died later at Aspen Valley Hospital. Charles Wyly was survived by his wife Caroline �Dee� Wyly, brother Sam, four children and seven grandchildren. In 1963, Sam Wyly founded University Computing Company, a computer software and services company, and served as President or Chairman from 1963 until 1979. University created a computer utility network, one of the earliest and most successful marriages of computing and telecommunications. University was one of the original participants in the software products industry in the late 1960s when the then market-dominant IBM unbundled computer hardware and software. Mr. Wyly was called "one of the most--if not the most successful post-war entrepreneurs" by Fortune magazine senior editor Gene Bylinski. After his graduation from Michigan in 1957, Mr. Wyly worked for five years at IBM and Honeywell. He was a contemporary of Ross Perot at IBM and, like Perot, struck out on his own in the computer business. Mr. Wyly founded University Computing Company (UCC) in 1963, which went public in 1965 and earned its investors a 100:1 return in the next four years. He has since been a highly successful investor and the founder of several other public companies. He is currently governing stockholder and managing director of Sterling Software, Sterling Commerce, Maverick Capital, and Michaels Stores, all based in Dallas.